The average American gains 1 to 2 pounds a year. That is as little as 10 extra calories a day–less than one bite of food. This weight gain is so subtle that most people don’t even know it is happening until one day they tune in and discover that they have gained 20 to 30 pounds since high school. In this article, I am going to help you better know the enemy and share with you the top 10 causes of weight gain. It is only by knowing the enemy and yourself that you can enjoy the weight that works best for you. While not especially lean, I weighed a respectable 180 pounds in high school. My first year away at college, rather than “The Freshman 15,” I actually added “The Freshman 25” and hit a peak weight of 205 pounds during my first nine months away from home. Fortunately, I started exercising again after my freshman year of college, which helped prevent further weight gain. However, it did not allow me to lose all of the weight I had gained. I carried that extra weight around for two more decades until my 40s when I was forced to change my diet and lifestyle due to other health problems. To better know the enemy, most of the scientific data I am going to share with you is from a seminal Harvard study published in the most prestigious medical journal, the New England Journal of Medicine. This study involved 120,877 U.S. men and women and the lead author was my former classmate, and fellow cardiologist, Dr. Dariush Mozaffarian. What surprised me most about this Harvard study was that it wasn’t just one thing that cause people to gain weight. Rather, it was a cluster of bad habits and lifestyle choices that led to 1 or 2 extra pounds each year. Unfortunately, as the weight goes up so do chronic medical problems as well as the need to take lifelong medications and make appointments with the cardiologist or other doctors. I should also point out that these top 10 causes of weight gain have also been seen in other studies. Also, the Harvard study did not show causation but rather correlation. In other words, weight gain was observed to happen in people who reported doing these 10 things–whether or not this was the actual cause of their weight gain cannot be determined from this Harvard study. It should come as no surprise that not exercising was the number one cause of weight gain. While a weight gain of just 0.44 pounds per year (0.2 kg/yr) may not sound like too much of a price to pay for not exercising, this adds up to a total weight gain of 21 pounds (9.4 kg) from high school to retirement at age 65. While many people mistakingly feel that you can exercise off a bad diet, the research just doesn’t support this. Exercise is for maintaining not losing weight. Even during my marathon running years, when I was running 20 or more miles a day, I never seemed to burn off the extra weight I gained from my freshman year of college. The number two cause of weight gain caught me by surprise. While I knew French fries and potato chips caused people to gain weight, I would never have predicted that this effect would be stronger than sugary drinks. Even more surprising was that the average person in this study only ate French fries or potato chips one time per week at most. I suspect the reason why fries and chips are so dangerous to your waistline is because these processed potatoes are instantly converted to sugar in the body, they contain high amounts of unhealthy oils, and the same people who eat fries are more likely to eat other junk food as well. As with a lack of exercise, this gradual weight gain from fries and chips, on average, adds up to a grand total of 20 extra pounds (9.1 kg) by retirement. Number three in this Harvard study also came as a surprise to me. While I was well aware of the ultra artery clogging effects of trans fat, I had no idea this toxic fat also causes people to pack on the weight. When it comes to trans fat in the diet, most of my patients mistakingly believe this is no longer a problem as all of their packaged food labels read “zero” for trans fat. What they don’t understand is that, based on lax reporting guidelines, processed food companies can create such unrealistically small portion sizes so that the trans fat content in a “microscopic serving” is below the required reporting level of 0.5 grams. To keep your arteries clean and your weight in check, if you see “partially hydrogenated oil” anywhere on the ingredient list then this is something that you should never eat. When it comes to trans fat, there is no safe amount you can eat. In addition to processed foods, the worst trans fat offenders are fried foods, microwave popcorn, and store bought bakery items. If you give in and eat processed or fried foods you can count on gaining an average of 17 pounds (7.7 kg) and a likely visit to a cardiologist by retirement age. While falling much lower on this list than I would have expected, sugary drinks are still an important cause of weight gain. In addition to sugary drinks, other forms of sugar like desserts, refined grains, and fruit juice combined also added up to an additional 0.25 pounds/year (0.11 kg/yr). By refined grains, I am referring to the typical grocery store breads, pastas, cereals, crackers, etc. Thus, if you do sugary drinks, desserts, refined grains, and fruit juice you can expect to gain 0.5 pounds/yr (0.22 kg/year) from your sweet tooth–an even greater effect than not exercising. It is interesting that fruit juice did not cause as much weight gain as sugar sweetened beverages like Gatorade or soda pop. The lead author of the Harvard study, Dr. Dariush Mozaffarian, was also surprised and explained that the reason was likely because they found that most people seem to drink sugary beverages in much greater quantities than fruit juice. Once again, it did not take much to increase weight. The average person in this study only had a little more than 1 sugary drink per week and 1.3 servings of dessert and 1.2 servings of refined grains each day. Regardless, doing all forms of sugar namely sugary drinks, desserts, refined grains, and fruit juice, even in very small amounts, can add up to a hefty 23.5 pound (10.7 kg) average weight gain by retirement. For those who follow a dietary regimen that advocates meat, I’m sure the number five cause of weight gain in the Harvard study comes as a surprise. I should point out that all meats are not raised and processed equally, and that most of the 120 thousand plus people in this study were eating the typical grocery store or prepared forms of meat which come from antibiotic and hormone treated animals. Equally as strong as red meat for weight gain in this study were processed meats. By processed meats I mean meats like bacon, hot dogs, sausage, and deli meats. If you eat processed meats you can expect to gain an additional 0.23 pounds each year. Thus, eating both red and processed meats will cause you to gain, on average, 0.47 pounds per year or 22 pounds (10 kg) by retirement. I should point out that the people in this study did not eat much red or processed meats. Indeed, the average person had less than one serving daily of red and processed meats combined. If you are a meat eater, and don’t want to gain weight, then the Harvard study would suggest giving up red meats as well as processed meats and instead focus on poultry or fish. Most of us also know that we naturally crave junk food when we are feeling stressed. Stress causes changes to the hormones that regulate hunger. According to the study I use to calculate the damage from stress, you can also count on gaining an average of 7 extra pounds (3.2 kg) if you are under a lot of stress. Most people intuitively know that they also crave junk food when they are tired. I know this is a weakness of mine after I have been up all night in the hospital taking care of patients. Sleep deprivation is a well known cause of activating our hunger hormones in a way that causes weight gain. What most people don’t understand is that when it comes to weight gain, over sleeping seems to be just as dangerous as under sleeping. In a separate study I use to calculate the weight gain risks associated with sleep duration, it shows that sleeping under 5 hours or over 9 hours a night puts you at risk of weight gain. Based on these definitions, if you under or over sleep you can count on gaining an average 7 extra pounds (3.5 kg) from high school to retirement. In the 1980s and 90s a, few people would have been surprised to see butter on this list. Yes, it is true that butter is much healthier for you than the trans fat containing products, like margarine, from the 1980s and 1990s. While butter made the top 10 based on the data from the Harvard study, I should point out that dairy had mixed effects when it came to weight gain or loss over time. For example, the Harvard study showed that cheese also caused weight gain but milk was neutral and yogurt even caused significant weight loss over time. Thus, the type of dairy seems to be important in determining whether or not you gain or lose weight with dairy. For the worst dairy offender, butter, it can cause you to gain an average of 6 pounds (2.7 kg) from high school to retirement. As with dairy, the data on alcohol and weight gain are mixed. Heavy beer drinkers seem to show the highest weight gains from alcohol. In the Harvard study, alcohol drinkers can expect to gain an average 0.1 pounds per year or 5 pounds (2.3 kg) by retirement. Rounding out the top 10 list are electronic devices. When this Harvard study looked at television watchers, they found that just 36 minutes a day contributes to an average four extra pounds (1.7 kg) by retirement. So there you have it, the scientifically proven 10 best ways to gain weight as an adult. When it comes to changing any bad habit, the first step is awareness. As the 5th century B.C. famous Chinese general, Sun Zi taught us in The Art of War, the key to wining any battle is to know the enemy and yourself. Now that we have identified our top 10 enemies in weight gain, it is time to become aware and create an environment that helps us to conquer these enemies. What is your number one weight gain enemy? What has helped you to battle this enemy? We all recently saw the headlines, too much sitting increases our risk of cancer by up to 66%! Sitting really is the new smoking. If you figure that sitting to watch TV for one hour shortens your life by 22 minutes and smoking one cigarette takes 11 minutes off your life then sitting down to watch that one hour TV show tonight is the equivalence of smoking 2 cigarettes. We all know we need to get moving more. Not only do we need to exercise each day but we also need to keep moving all day long. Sitting on our butts the entire day after a grueling one hour work out in the gym will undo any benefit we may have achieved in the gym. Our bodies were designed to move! We all need to get moving. Based on objective pedometer data, less than 1 in 20 American adults actually moves enough during the day. Every day I encourage my patients to get moving. Often when I make these suggestions, they have excuses. Let’s face it, we all have excuses why we would rather not move. Fact: Physical activity creates time. Being physically active will not only add years to your life, but will make the years you have vastly more productive. Exercise promotes energy, alertness, and concentration, increasing the productivity and quality of the time you spend at work and with your loved ones. A recent study in a prestigious medical journal found that if people could be physically active for as little as 15 minutes per day, that would improve their longevity by 3 years. That works out to be an extra 19 hours of life for every hour of physical activity. Even if you are not concerned with extra time later, how can you squeeze it in now? I get it. I am a busy cardiologist, serve as in coming president of a large international medical society, have church and community responsibilities, a family with three small children, and I am writing a book with my wife, Jane. I can only find time to exercise on my off days. What about the other days? As I have analyzed my time, I find that I spend two to three hours each day on a computer. With my treadmill desks and my bike desk I can now convert this “computer time” to “exercise time”. At my home we have an old treadmill that we purchased shortly after Jane and I were married 20+ years ago. It was a treadmill that was gathering dust and the incline button did not even work. With some old furniture we were not using, an old nightstand on top of an end table, we now had a perfect treadmill desk. The cost? Free. 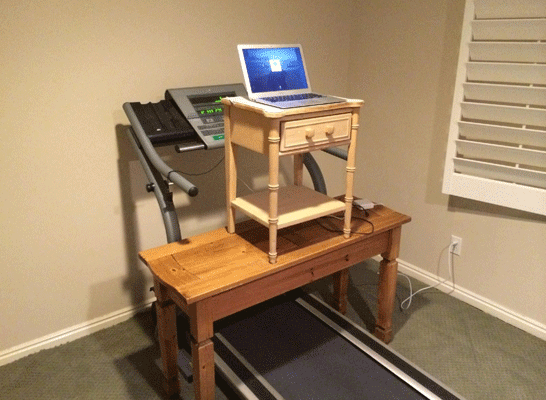 I have included a photo of my “poor man’s” treadmill desk at the end of this article. At the hospital it was a bit more challenging. I made a strong case and even offered to pay for a treadmill desk. Fortunately my employer, Intermountain Heathcare, agreed to buy the entire treadmill desk for me. If your employer is not in a position to help you with a treadmill desk, could you use a “box” marked for the recycle bin as your new standing desk? That is what I did prior to my treadmill desk. Studies show that even just standing while working can burn an extra 50 calories an hour and strengthen your leg muscles over the course of the day! To help mix things up at home, I took an old mountain bike that I was no longer using and with a bike trainer and some bricks, wood, and barrels we had in our basement was able to build a bike desk. Cost? Free. 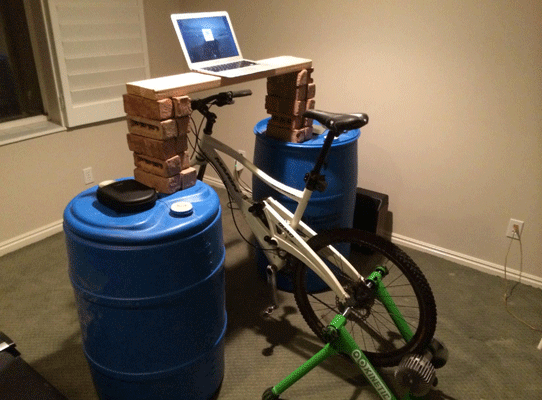 I have included a photo of my “poor man’s” bicycle desk as well at the end of this article. What if you don’t spend part of your day on the computer? Two of my patients, took their Lazy boy chairs out of their front room and replaced them with a treadmill and stationary bike. Now, when they “sit down” to watch TV or a movie at night they now exercise together instead. Is it any wonder why together they were able to lose close to 100 pounds and put their heart disease into remission? Fact: The right physical activity is physical therapy. If your body is injured, it will hurt more if you don’t use those muscles, tendons and joints. There is something every one of us can do to stay active throughout the day. Be creative! If your knees hurt, try swimming, water aerobics, riding a bike or cross country skiing. The right physical activity will strengthen whatever ails you and help you heal faster. This is exactly what I was doing before I made drastic changes in my own life. Little by little I was withdrawing from all physical activity because it hurt. Somehow I thought that if I just rested my (fill in the blank) that I would start feeling better. I sat all day for my surgeries. This only made things worse for me. Paradoxically, by standing to do my surgeries all day long, along with other changes, allowed my joints and back to heal. Find something you can do, cross train, do physical therapy, something until your injury resolves. Many of my patients with severe joint problems and obesity have found swimming, water aerobics or even walking in a pool against the current to be very therapeutic. Do something. Your life depends on it! Fact: Physical activity can be free or even save you money. You do not have to pay for a gym membership or buy any equipment to begin being physically active. There are many things you can do for free. It does not cost anything to go for a nice walk. It may even be healthier to be physically active outside. All you need is a good pair of shoes to start today. Be creative. You may even be able to save money by exercising. Can you bike to work? Many of my patients bike to work from April through October. Depending on your gas mileage, most of my patients save over $2,000 a year. What if you could eliminate one car in your household? Better yet, biking to work could give you 60 minutes of exercise time while only “costing” you 20 more minutes than what you would have spent driving your car. Imagine that, a 60-minute work out with only a 20 minute time investment! Fact: Physical activity is vital for children too. We have three young kids so we understand it can be a challenge to find any/enough time for yourself. Try taking turns with someone else, watching the kids while the other engages in physical activity. Better yet, try getting your kids involved. It will help them build healthy habits and it can be fun. If they are really young, push them in a jogger stroller or pull them behind your bike. Just last night we biked as a family to Grandma’s House. Go for a walk or a hike together as a family. I ski with my kids every week during the winter and spring. Plan physically active family vacations. Fact: Physical activity will give you more energy. Do you feel too tired after a long day at work to be physically active? Do you just want to relax? It can be difficult to get off the couch when you are feeling drained, but within a short time, you will feel more energized and alive physically, emotionally, and mentally. Studies show that the best energy “pill” we have is to be physically active all day long. Put your work out clothes and exercise gear out ahead of time. Schedule a time to exercise with a friend. Not wanting to have to put your clothes or exercise gear away for nothing or let your friend down, you will be energized in the end. Fact: Physical activity will tip the scale in your favor. Regular physical activity will increase your metabolism so you will burn more calories even while at rest. Most people naturally start to make healthier food choices once they begin exercising. Unfortunately, others, like me in the past, believe they can eat anything they crave as long as they burn off the calories. The trouble is that exercise rarely works alone. Unfortunately, exercise increases your appetite. An energy drink and a big unhealthy meal following your workout will completely undo any benefit you may have achieved. You also cannot look at exercising as “punishment” for unhealthy eating. You have to eat right and move your body. The two work together. While physical activity decreases most people’s desire to eat junk, in some people physical activity can trigger the desire to eat the junk. Perhaps this was due to years of conditioning from playing little league sports where we routinely reward our children with donuts and fruit juice following their workouts. Remember, that sports drink and what ever other junk you go for after your work out will undo any benefit you may have achieved. Physical activity is not a free ticket to eat junk. Staying active may be enough to maintain a healthy weight when you are younger, but as you grow older, you may find it increasingly difficult to lose weight. It may take more time for all the benefits of your new routine to develop. Be patient and think of physical activity as a lifelong plan. Fact: Physical activity will enhance your self-esteem. Do you feel intimidated to go to a gym or exercise in your neighborhood? If you worry about not having the “right” clothes or the “right” body to fit into the gym culture or be out in your neighborhood, please consider that this is the time to honor and take care of yourself, rather than being held back by fears of what others may or may not think. Also, you don’t need to box yourself into going to a gym if it doesn’t work for you. There are plenty of activities you can choose in lots of different locations. Be creative and be willing to experiment. You deserve to feel great and exercising is one of the best ways to feel more comfortable and confident about your body. Fact: You can be physically fit at any age. If you have never been active, you now have a chance to get in the best shape of your life. You may not be as fast or as flexible as you once were. It is natural for our bodies to change over time. You simply need to redefine what it means to be physically fit at each stage of your life and go for it! My patient, Mary, could barely even walk without becoming short of breath. She did not let this stop her. With encouragement and tracking her daily results, she was able to build up to seven miles a day within 3 months! It is never too late to change! Fact: There has to be something you enjoy doing. I think the problem here is that most people equate exercise to going to the gym. I get it. If exercise meant that I had to go to the gym I would hate it as well. I hate the gym and have not been to a gym in years. For me, I have to be outside or in the mountains for physical activity to be fun. When my patients ask me what type of exercise should they do I always answer, do something you enjoy. If you enjoy it you will stick to it. There has to be something you enjoy. Do something every day. Do you like dancing? Go dancing. Do you like golf? Then golf and carry your own clubs. Stay away from the cart at all costs. Do you like gardening? Then please garden as this is an incredibly beneficial activity with many health benefits. Fact: Except in rare cases, being physically active is one of the best things you can do for your body. When I encourage patients to be more physically active, I often hear the excuse that they are afraid they might hurt their heart or even die. I am saddened by these fears they share with me nearly every day that I am in the clinic. If you have experienced any of the following symptoms, please talk to your physician before becoming physically active again: extended period without physical activity, pre-existing cardiac condition, shortness of breath or chest discomfort. Except in very rare cases, being physically active is one of the very best things you can do for your heart. Amazingly, study after study shows that for patients surviving a heart attack or even living with heart failure, one of the best things they can do to improve their health, wellness, and longevity is to be very physically active. Just days after a heart attack, we get our patients into an exercise program. Try to be honest with yourself: your excuses may be unnecessarily limiting your life. These excuses are common. Odds are you’ll see yourself somewhere in this list. Even my wife, Jane, and I have used some of these excuses from time to time. The bottom line is that despite whatever limitations you may be facing, there’s always something you can do. Be creative and remain open. Studies show that every effort you make will increase rather than decrease your capabilities over time. What do you think? What do you do to stay active? Please let me know. You can leave a comment by clicking here. #003 (UPDATED) Can Too Much Exercise be Bad for You? The modern day marathon was inspired after Pheidippides, a long distance running courier in ancient Greece. During two days he ran a total of 175 miles. On the last leg of his run, a 25 mile distance from the battlefield near Marathon to Athens, he died suddenly. Can the same thing happen to us if we run too much? Did you see the recent news reports that too much running is dangerous? What is the science behind these headlines? These headlines came from a recent study published in the Journal of the American College of Cardiology. In this study, researchers from Copenhagen reported their findings of 5,048 joggers and non-joggers who they had followed for 12 years. 1. The most intense runners had the same risk of dying as the coach potatoes. 2. Light joggers who jogged between 1 and 2.4 hours each week, for no more than 3 times each week, at a slow to moderate pace were the least likely to die. 3. Moderate joggers did not survive as well as the light joggers. 4. Running faster than 7 mph, jogging for 2.5 hours or more each week, or jogging more than 3 times per week increased the risk of premature death in this study. Can we believe the results of the Copenhagen City Heart Study? For the runners reading this article, like me, our first question is how reliable are these data? And, just what is the optimal dose of running? Like most medical studies, this study was definitely not perfect. For example, there were only 47 joggers in the group that jogged the most (more than 4 hours a week). In this small group of 47 joggers in this study who ran more than 4 hours a week there was only one death. Had that one person not have died during the study then the results would have been completely different. Interestingly, this study did not even report what this one runner even died from. For all we know he could have died in a car crash that had nothing to do with his love of running. While we can certainly poke holes in the conclusion of this study, this study is in line with a growing body of research that shows that extreme levels of exercise may be dangerous to our health. The only difference between this study and the other studies is that this study reported that even low levels of exercise (jogging for more than 2.5 hours per week) conferred an added risk of death. Can what happened to Pheidippides happen today? For better or worse, too much exercise is something that 99% of the American public never needs to worry about. In fact, knowing that less than 5% of Americans even get enough exercise according to pedometer studies I hesitated even writing this article. I recently read the epic masterpiece by Christopher McDougall entitled “Born to Run” (affiliate link) which reignited within me my passion for marathon running. A number of years ago during my health crisis I had to give up running due to severe knee pain. Since completely changing my lifestyle I was able to reverse my knee pain in addition to many other medical conditions. Prior to becoming a cardiologist, I had run 5 marathons including the legendary New York City Marathon twice. You will notice the photo of my 1992 New York City Marathon finish. Now that I have completely regained my health and am able to run again I would love to train for another marathon. However, as a cardiologist, I have to question if marathon running, or any ultra endurance event, is really the best thing for my health. Outside of the wear and tear on our joints from marathon running, just what is happening to the heart? Interestingly, there is now a cardiac condition called Phidippides Cardiomyopathy. In this condition, the heart enlarges, weakens, and becomes very susceptible to a cardiac arrest after extreme levels of exercise. Indeed, studies have shown that marathon runners experience transient enlargement of their hearts after a marathon. Other studies have shown that 13% of marathon runners permanently “scar” their hearts. It is not just marathon runners who are at risk. Studies have also shown endurance cyclists and cross-country skiers are also at risk of cardiac complications. For example, endurance athletes often have cardiac enzymes, from cardiac cell death, in their blood following an endurance race. It should be pointed out that cardiac enzymes in the blood is an ominous finding and is one of the ways we diagnose a heart attack when anyone, usually non-athletes, when they present to the emergency room with chest discomfort. Fortunately, the vast majority of these cases of Phidippides Cardiomyopathy completely resolve. However, in a small subset of people they actually go on to develop heart failure. In addition to Phidippides Cardiomyopathy, endurance athletes also appear to be predisposed to developing a dangerous arrhythmia called atrial fibrillation. Tragically, one of the key characters in Christopher McDougall’s book, Caballo Blanco, an ultra marathoner, died of a cardiac arrest while running just 3 years after the book was published. At autopsy he was found to have an enlarged heart and likely also developed Phidippides Cardiomyopathy after a life-time of ultra marathoning. How can they escape most of the Western diseases like heart disease, dementia, diabetes, obesity, etc. and yet never exercise? The answer is really quite simple. 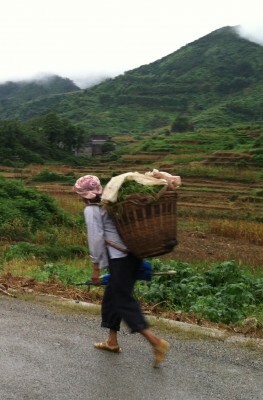 They are physically active all day, every day farming by hand. They do experience short periods of high intensity training like when they need to carry a 50-70 pound basket of produce on their backs while walking up the side of a mountain. Their form of “exercise” is very gentle and does not stress the joints. Could this be why none of them had undergone joint replacement surgery but yet could walk without a limp even at an age of more than 100 years old? Just how much exercise should we aim for? Let me share with you four simple strategies that I recommend for my patients. 1. Make it a daily habit. Commit to 30 minutes of moderate intensity exercise or 15 minutes of high intensity exercise each day. If you think about it, 15 minutes over the course of a day really is not much time. Even the busiest of people can carve 15 minutes out of the day to protect their health. 2. Find an exercise you enjoy. It doesn’t matter what you do for exercise as long as you enjoy it. Unfortunately, half of all people who start an exercise program quit within 6 months. The key, therefore, to making exercise stick is to find something that you enjoy. Exercise does not mean just going to the gym. Personally, I hate the gym and have not spent anytime in a gym for years. Rather, exercise could be dancing, walking, skiing, hiking, or just about anything that moves your body. Even better is to mix up your exercise routine to minimize the risk of injury and work different muscle groups. Studies show that those who exercise with others are more likely to be successful. If you don’t have anyone you can exercise with then track your work outs. Studies show that either approach will increase your chances of making daily exercise a lifelong habit. In addition to exercise, it is also just as important to remain physically active throughout the day. Studies have shown that people who sit for most of the day (i.e. desk jobs), cannot reverse the ill effects of sitting all day even if they exercise vigorously each day. For example, if you sit more for more than 3 hours a day then you lose 2 years of life according to this study. When we sit our large muscle groups are at rest which leads to changes in our body’s metabolism and how we process glucose. 10,000 steps represent the equivalent of walking approximately 5 miles. I have found that even my elderly patients can log 10,000 steps a day. Just the act of tracking your steps causes you to take an extra 2,000 steps (1 extra mile) without even knowing it. With thoughts of the Copenhagen City Heart Study and Phidippides Cardiomyopathy in my mind, I think I will hold off on training for any more marathons. Do you agree? Please note that this article was revised and updated on February 6, 2015.